Even though this winter has been a mild one for us, there have still been plenty of cold days requiring getting all bundled up before heading out. Unfortunately, without having a coat closet on the first floor, we are limited for storage of all of our gear. 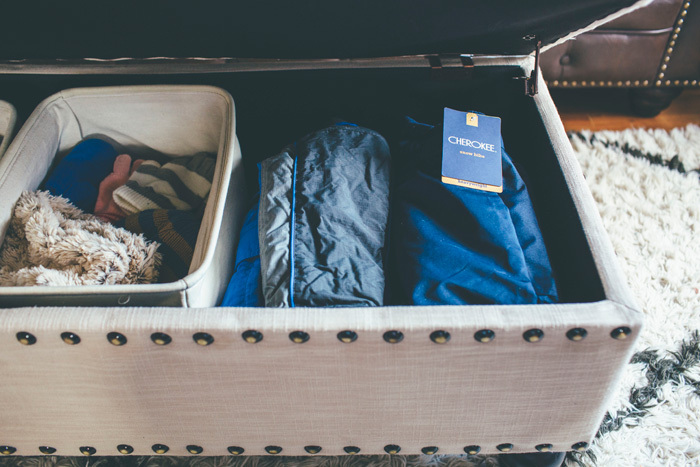 Today, I am sharing some solutions that have worked to help keep it all organized. Our home, thankfully, has decent sized closets upstairs, but not even one downstairs! We do have a small “mudroom”, that leads to the basement, off the back of the house, but we never use that entrance. The space is in pretty rough shape and it’s very tight, so it’s not practical for our daily use. Since the front door of our home opens directly into the main living room, I am always trying to think of new ways to hide all of the outdoor essentials. In winter, even more so with extra boots, snow pants, gloves, hats, scarves, etc. As a family of four, it has getting tricky, but I have managed to make it work the best we can. One of the first things I had my husband do when we moved in, was to add a coat rack to the small wall behind our front door. 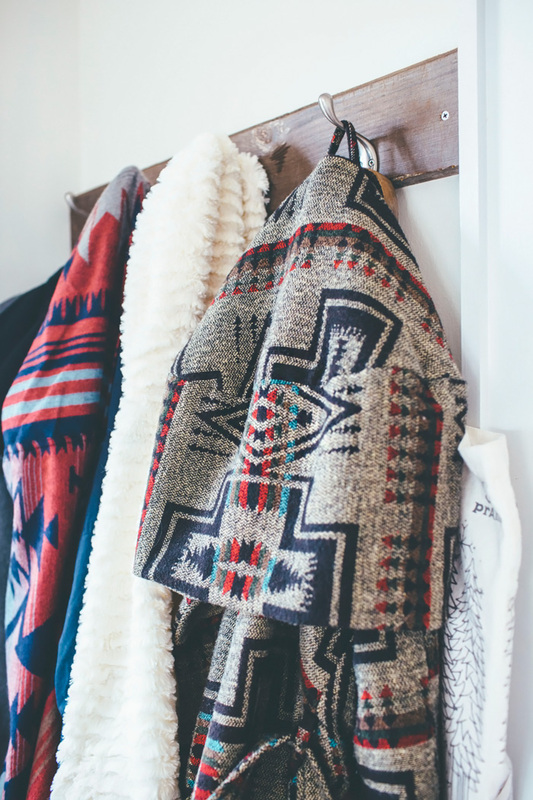 It has been great for keeping coats accessible without taking up much space. I move out non-seasonal items and strive to only keep the ones that we use most frequently here. Otherwise it looks cluttered and makes it harder to search through when we are in a hurry (which is often in the those early mornings!). 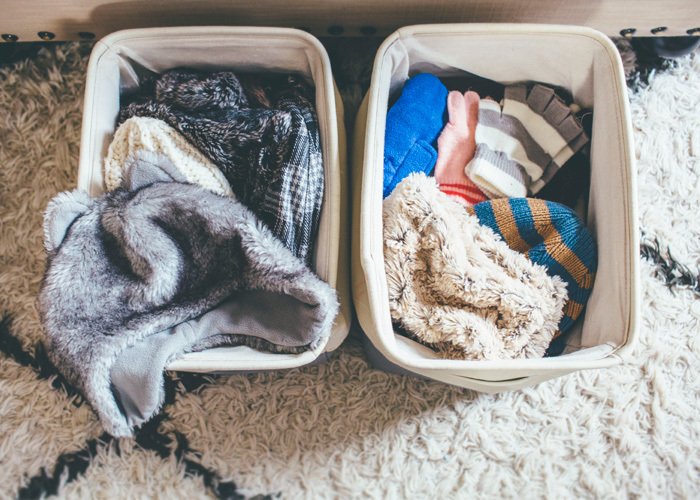 The remainder goes upstairs in our closets or in bins stored away until the proper season. I’ve shared our entry area several times on my blog in the past. Click here if you want to see it as it was when we bought this home and the first time I revealed it a few years ago. It has changed a bit since then as my style has evolved, and I seek more simplicity in our home. This year, we added an inexpensive boot tray from Lowe’s (similar to this one – affiliate link*) which has helped with keeping wet/snowy/muddy shoes and boots in one spot. Owen thinks it looks like the shape of a Sour Patch Kid so he thinks it’s pretty great 😉 There are lots of “fancier” ones, of course, but this works for us. This “coat rack” is really just a salvaged piece of wood from my mother’s house. My husband secured it to the wall with screws and we added some hooks (similar to these – affiliate link*) from Target. (My winter coat is from Target for those who are curious – I checked, but it doesn’t seem to be available online through Target. It’s the Mossimo Supply Co. Wool Wrap Jacket in “Brown Jacquard”). 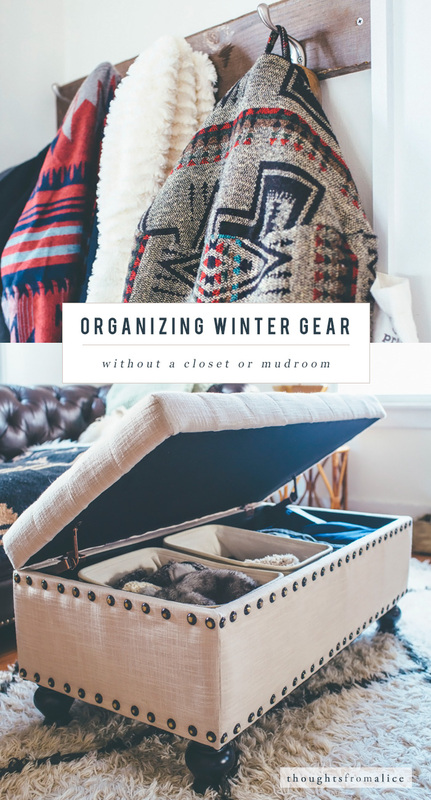 So that takes care of our coats, bags, purses and boots…but what about all of the other winter gear? 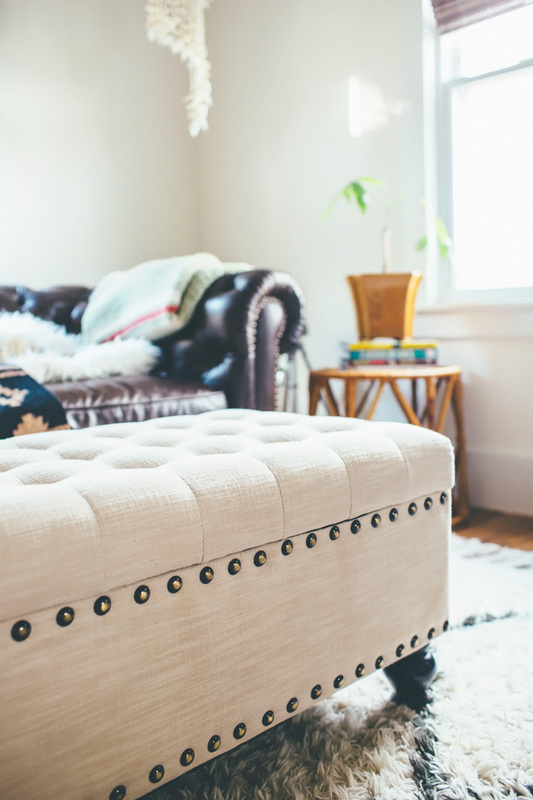 Last spring, while shopping at HomeGoods with my sister, I found a tufted storage ottoman. It seemed, at the time, like a great investment for our living room, and while the $150 price tag was a bit high for this thrift store loving girl, I decided to go for it. These days, I think it’s a little too traditional for my taste, but it still functions really well as a storage spot. I didn’t want to just throw everything into it because I knew that would not help us in the morning when we need to get out of the house to take Hazel to school. I decided to take two bins that I had originally bought for storing toys, to tuck inside of it. I went through all of our gear, before organizing it, to pull out items that no longer fit, or that just didn’t get enough use to warrant keeping. Decluttering has been a major goal for me for the past six to eight months and it has been so refreshing! We keep what we use most right on top. I tuck the kids gloves inside the hats that they wear every day and we make sure to put them all back when we get home! It really does make a world of difference not having to scurry around looking for that one lost glove. The other side of the ottoman holds the kids large winter jackets and snow pants (as you can see, they haven’t gotten much use this season – their snow pants (affiliate link*) still have the tag!). One of the things that I really love about this ottoman is that the lid stays open on its own and closes gently. Perfect when little hands are digging in to find their gloves and hats! It’s really been a simple solution, and while a mudroom or actual coat closet would be my dream, this has been working well for us. I hope it inspires you, if you live in a small space and/or struggle with this issue in your own home situation! I was able to find this almost identical ottoman for sale on Wayfair for around the same price! It may be the same but mine has no tag or maker information on it so I can’t be certain, and it has less nail heads than those shown in the picture below. 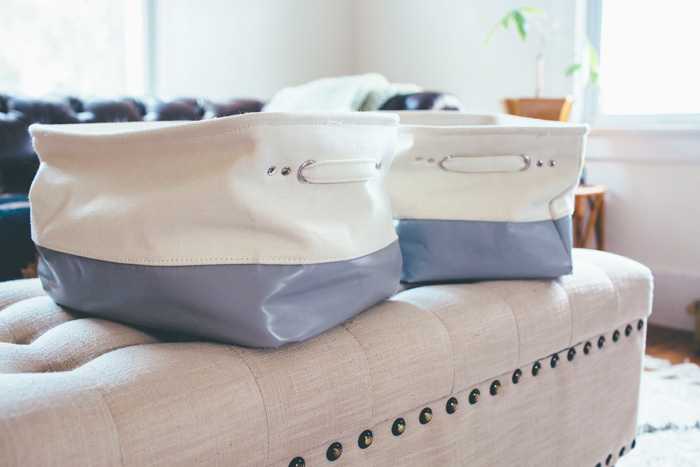 I have rounded up some more storage ottomans for you that I found online. These are all under $200. 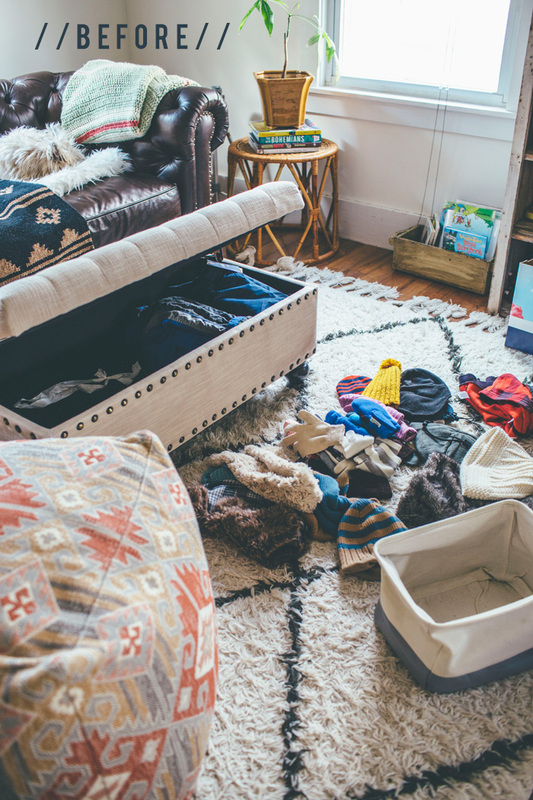 It really is a good investment if you live in a small space or a home without large closets! Next week, I will show you how I’ve styled the top for winter with a new tray my mom gave to me for Christmas! Hope you will return then and this weekend for our Sundays at Home Link Party…we have an exciting announcement! Father’s Day Gift Jar: “Dad’s Stache” Free Printable! That's so clever Alice! 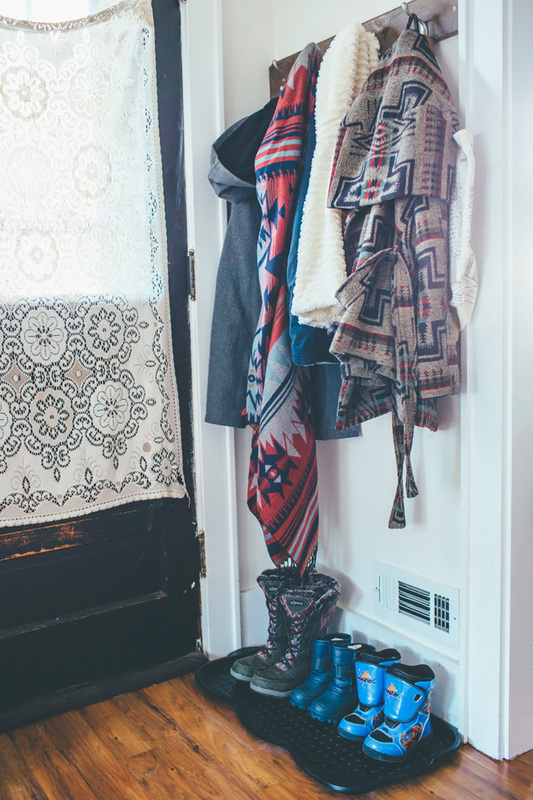 I also don't have a closet or mudroom at the entrance of our home, we don't get snow here, so it isn't really necessary, however, I do need to organize all the little accessories and baskets are always a great idea. 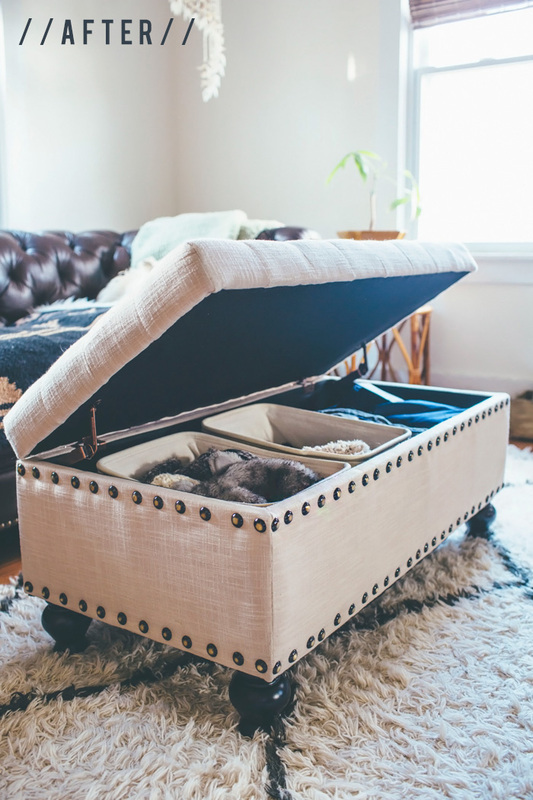 I love the ottoman, that is such a great way of using the inside storage space! Happy Weekend, always love your posts! I just bought a giant wicker trunk off CL for my son's bigger trucks but now I'm thinking I might steal it to do this! What a great & attractive organizing solution!